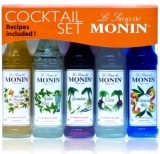 Monin syrup coffee gift set with 5 miniature syrups for indulging in flavoured coffees. Contains a recipe guide for ideas and inspiration. Caramel Ingredients: Sugar, water, flavouring, acidifying agent: citric acid, colouring agent: E150a. Vanilla Ingredients: Sugar, water, natural flavour, vanilla extract, concentrated lemon juice, preservative agent: E202. Hazelnut Ingredient: Sugar, water, flavouring, concentrated lemon juice, preservative agent: E202, colouring agent E150b. Contains Hazelnut extract. Gingerbread Ingredients: Sugar, water, flavouring, acidifying agent: citric acid, natural cinnamon flavouring, colouring agent: E150a preservative agent: E202. Chocolate Cookie Ingredients: Sugar, water, flavouring, colouring agent: E150a. Caramel Latte - Add 2-3 teaspoons monin caramel syrup to 1 shot of espresso or 1 tablespoon instant coffee and 1 cup of hot frothy milk.